View the beautiful blue/green water and sugar white sand from inside this comfortable townhome, that is right on the beach. This area is teaming with nature situated between two parks. Watch the dolphins, collect shells, take a beautiful walk to Camp Helen bird sanctuary, look for turtles nests, catch fish from shore, plus watch seagulls and pelicans in endless flight. Enjoy sunsets every evening. Golf at World Class Courses and deep sea fishing charter boats within minutes. Eat at the areas great restaurants or enjoy grilling right on the Gulf of Mexico. A wonderful get-away to just relax, read and enjoy. The master bedroom is also Gulf-front, enjoy the sound of the waves and watch beautiful stars and the moon sparkle on the water. The master bedroom has a King-size bed with TV, DVD, and private bath with tub/shower. The guest bedroom has two queen-size beds with TV, VCR and private bath identical to the master. There is a half bath on the main level. Situated between Carillon and Rosemary Beaches. Inlet beach is an enclave of Florida at its best! The place is in great shape right on the beach, walk out the slider and step in the sand. A short drive to lots of tourist spots and other things to do. I would definitely go back. The owner was very easy to work with, responsive and very thorough. I have nothing negative to say, it was a very nice trip for me and my family. You don't get closer to the Ocean than this ..
You don't get closer to the Ocean than this ..unless you are on a boat ;). This house was perfect home away for our family. You walk right on to the beach from the back porch . House was clean and well stocked and had everything we needed for our little ones first beach trip. There are tons of great places to grab a bite or shop near by(RoseMarry ), a state park for taking a stroll and there is a publix in about 5 minutes for grocery shopping . Robert (Bob) was great with communication, and made sure we had fun at the house. Perfect location with the beach a few steps away!! Literally!! Can’t wait until our next family beach vacation!! 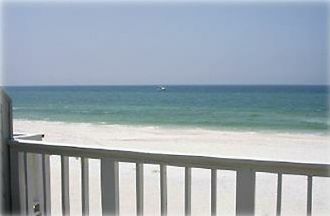 This property is awesome and will be our first choice on all our beach trips!! The condo was perfect. Great location, close to we wanted to do! The condo was great. It was perfect for us. We loved how we could walk out the back and we were just steps from the beach! I spent my birthday week at this condo with my husband, son, and daughter in law. I want to begin by saying that this condo has the most beautiful gulf front view I have ever experienced in my many trips to the gulf coast. Reservations, payment, and arrival were simple and easy. The owner was very helpful and so easy to communicate with. Condo was clean and well stocked with extremely comfortable beds. We enjoyed grilling local seafood each day - especially on a Thanksgiving. We visited Camp Helen and enjoyed the walking trails and the Old Florida feel of the park. Best of all were the long relaxing walks and just being reminded of God's handiwork at every turn. I look forward to our next visit to this perfect townhome. Thanks, Bob! Please call to discuss your vacation, area & our place.